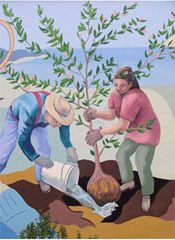 Sanchez Art Center proudly presents its third annual 50-50 Show from August 26 through October 2, 2011. 50-50 Show III is an art extravaganza that fills the Main, West, and East galleries with 3,400 original artworks. Juror DeWitt Cheng, noted curator, author, and art critic, selected 68 artists from 117 applicants, and these 68 artists have dedicated themselves to creating 50 small artworks in 50 days. It’s a challenge for the artists and a true bonanza for art lovers. 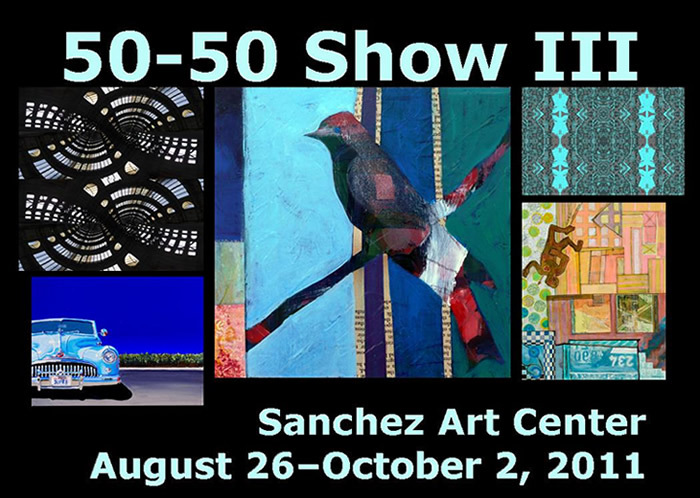 50-50 Show III is a fundraiser for Sanchez Art Center, so all artworks are for sale at affordable prices, with many artists offering a 10% discount on the purchase of two or more pieces. Beginning on opening night, August 26, buyers will have the option to take purchased works with them. Besides the Grand Opening on Friday, August 26, 6–9 pm, which is free to the public, there will be a ticketed Preview Party for early bird viewers on Thursday, August 25, 7–9 pm, with $10 tickets (plus $1.34 service charge) available at www.BrownPaperTickets.com or 1-800-838-3006. A limited number of tickets will be sold in order to ensure a comfortable viewing experience. If tickets are still available, the cost will be $20 at the door on the day of the Preview Party. Preview attendees will be able to view the show in its entirety as well as to select and purchase works in advance of the official opening. Each artist works with just one art medium. The works you will see range from brightly colored folded paper to earthenware clay, from all kinds of mixed media and collages to holography, from cyanotypes to pen and ink drawings, and from encaustics to colorful enamels on copper. Of course, there are also some wonderful acrylic and oil painters, pastel artists, and photographers. Each piece is six inches square, and each artist’s works are installed in a square grid, seven across and seven down, with the fiftieth piece off to the side. Each artist has also chosen a theme for his or her 50 works, and the range of creative concepts is impressive. Some 50-50 artists are taking the opportunity to explore new places, such as the High Sierra, San Francisco’s stairways, coastal scenes, marine and urban waterfronts, and wildflower hikes from Pacifica to Mt. Rainier, Washington. Other artists delve into the world of abstract images, and yet others explore the world of dreams and memory. In sum, the 50-50 Show will be a veritable feast of visual art and creativity to be shared by all. After the August 26 opening night, galleries are open Friday, Saturday, and Sunday from 1 to 5 pm, through October 2. There is plenty of free parking. For more information call 650-355-1894 or email info@sanchezartcenter.org.